Take charge of your health, and your life. When did you stop exercising like you used to? In the midst of a crazy work week it can be tough to wake up early for a workout or to squeeze in a brisk walk at lunch. It’s all the more difficult if weight gain or a stiff back is keeping you from doing the things you’d really like to do. That’s why I wanted to give you these reasons to exercise. Exercise is a priority for all of us, especially in our current era when moving isn’t necessary to survive. #1 Protect your long term health. Consistent exercise (and healthy eating) gives you the best chance for better health, more productive living, and a longer life. Your daily choices are like deposits in the bank for your future well being. If you are one of the 3/10 US adults who does not exercise, you can increase your life expectancy by nearly 4 years with 3 hours of vigorous physical activity per week. *See references (7-9). 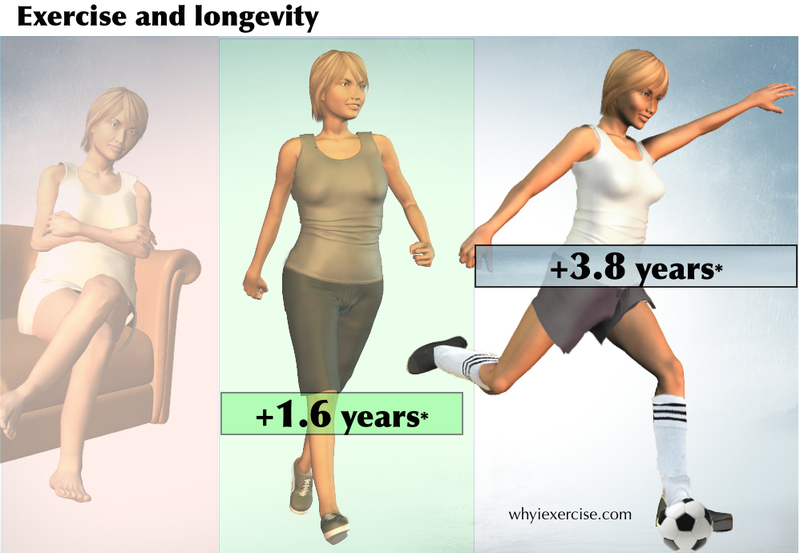 If you choose not to exercise, you are literally accelerating your aging process. 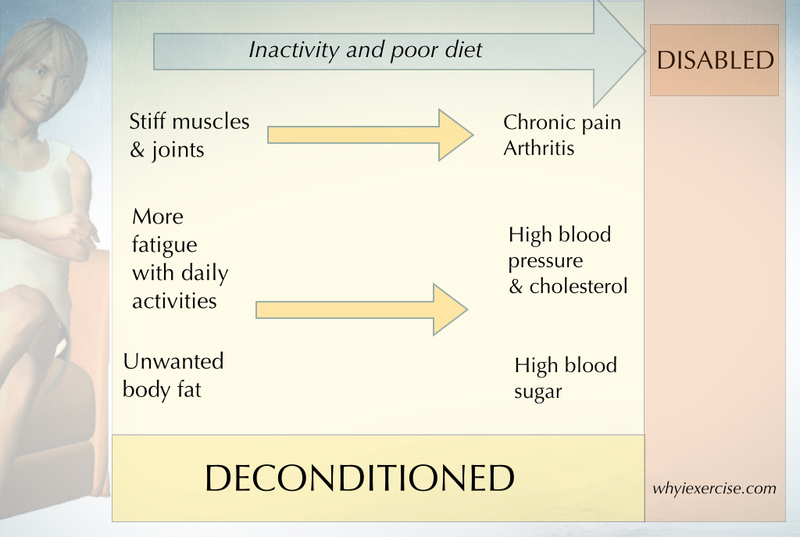 Habitual inactivity causes deconditioning. As you lose your conditioning, you’ll notice unwanted body fat, muscle and joint stiffness, and difficulty with basic activities like climbing stairs. If you reach this point and decide to continue on without exercise, you are much more likely to face problems with blood pressure, blood sugar, cholesterol and / or joint pain. You may need to begin medical treatment if your condition becomes severe enough. Once you become dependent on drugs and medical procedures to survive, you will have a significant drop off in your quality of life. Just as a poor diet leads to overweight, obesity and related health problems, lack of exercise leads to deconditioning, disability and ultimately immobility. 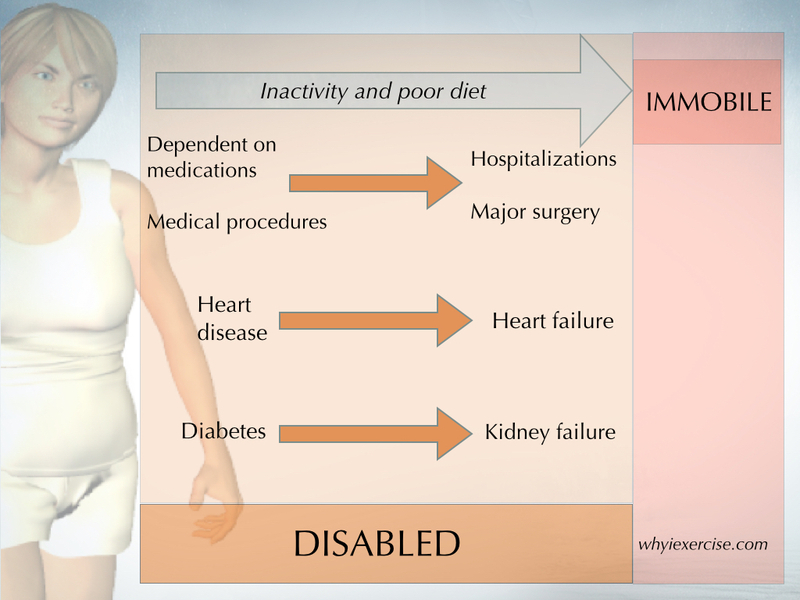 B. C., a former patient of mine, ignored these reasons to exercise. He chose not to be physically active as he worked very long hours at his auto repair shop--he wanted to make extra money for his family. He ate junk food at almost every meal, and maintained this lifestyle from his 20s through his 40s. Even as his health began to decline, B. C. did not listen to his doctor’s warnings. He continued with the same daily routine after he became diabetic and his blood pressure rose. Once he became very sick, B. C. was no longer able to provide for his family, and his health care costs became extreme. At the age of 51, B. C.’s vision became very poor and his left leg had to be amputated below the knee due to diabetes. He also developed congestive heart failure. His kidneys stopped working, and then he needed 4 hour dialysis treatments 3 days per week. During his physical therapy, B. C. was short of breath after walking only 40 feet with his prosthetic leg. As a disabled person in what could have been the prime of his life, B. C. deeply regrets the poor health choices he made. If only he had understood the reasons to exercise and maintain a healthy diet! Again, if you are an inactive person, 3 hours of moderate to vigorous exercise per week will lower your risk of premature death by 27%! 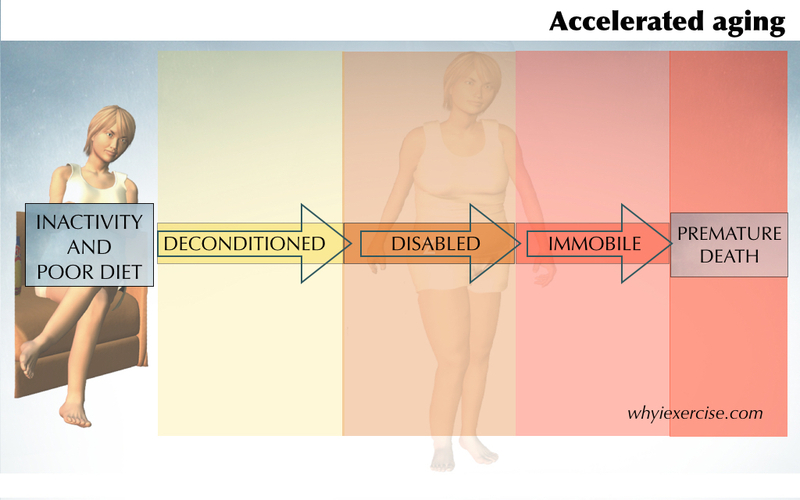 #2 Reclaim your vitality and physical ability. 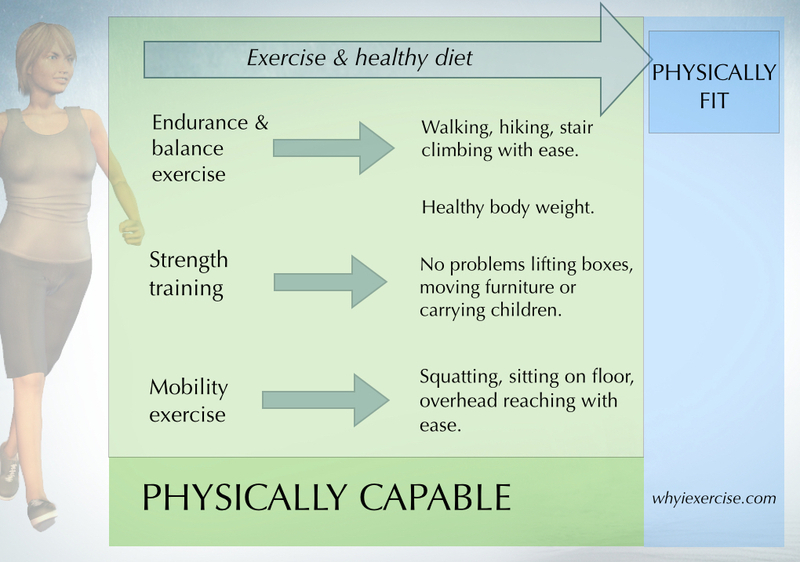 Exercise doesn’t only prevent disease and disability. Within one month of consistent training, you can noticeably improve your strength and stamina. A well designed training program can make it much easier for you to climb stairs, carry your groceries (or children), squat to the floor, reach overhead and more. Continue your training and increase your exercise intensity, and you’ll develop a higher level of fitness. An ongoing active lifestyle with 3-5 hours of moderate to intense exercise per week, while making you even stronger, will be more effective for reducing your body fat, normalizing your blood pressure and blood sugar, and reducing your risk of premature death. Include a healthy diet, of course, for best results. While working out at a neighborhood park, I noticed a 56-year-old man, ‘Michael’, do quite a few push ups and pull ups spaced between 5-10 minute jogs. We got to talking, and then he showed me 2 amazing gymnastics-type moves that I had never seen before. He had an incredible level of conditioning, especially for his age! Michael shared that he made exercise a priority for the past 30 years of his life. He fit strength training into his work day and he also made a point to go jogging several times per week. In his youth, he enjoyed the challenge of gymnastics exercises and he practiced them every week. Michael’s future looks very bright. Not only can he continue to work and provide for his family, he can do just about anything he wants to do! Michael will probably remain healthy for years to come. Why do we need reasons to exercise? 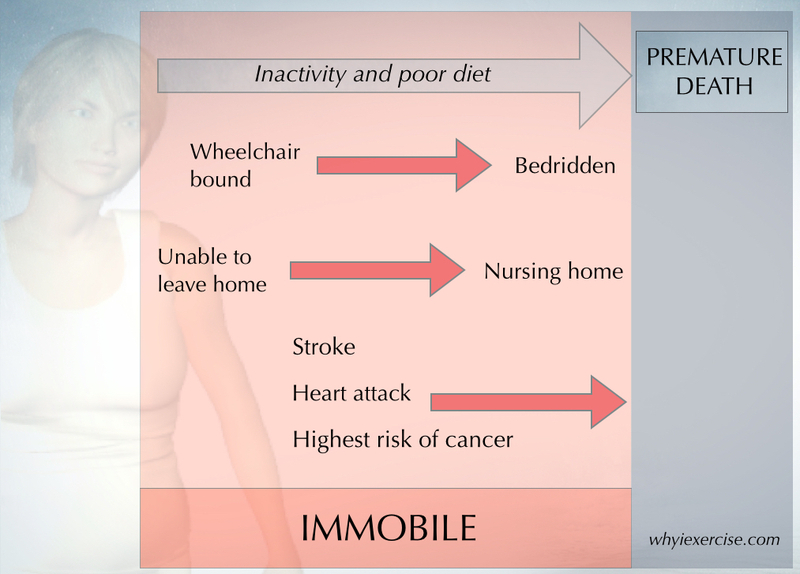 Lack of exercise (along with poor diet, smoking and alcohol abuse) contributes to the majority of illness, suffering, disability, and premature death in developed countries. 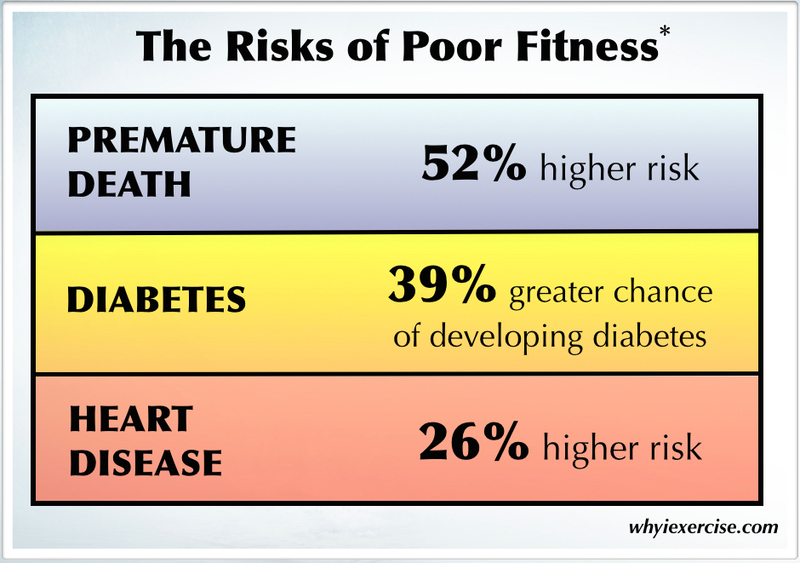 This is because poor lifestyle choices ultimately lead to chronic diseases like heart failure and diabetes. 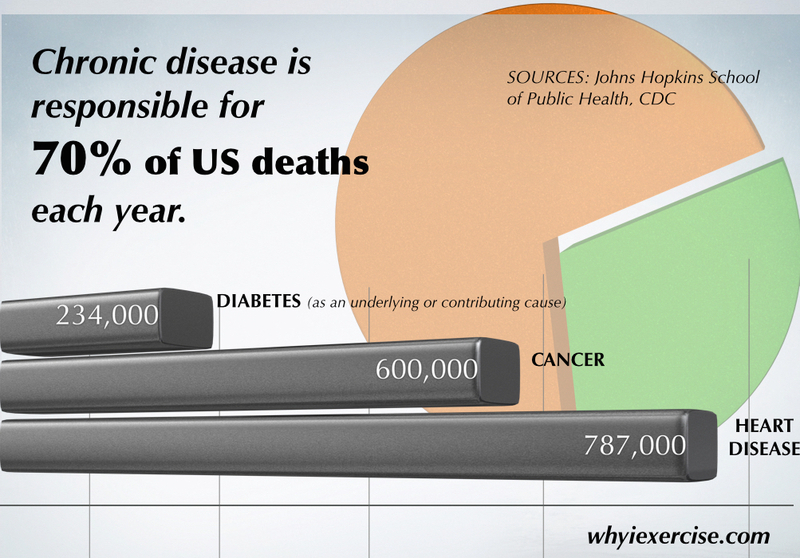 70% of US deaths and a tremendous amount of unnecessary suffering comes from chronic diseases. 86% of US health care spending goes toward the treatment of preventable chronic disease. 50% of US adults have one of more of the following: heart disease, stroke, cancer, diabetes, obesity and arthritis. 3/10 adults are not physically active in their free time. After reading this article, I hope you appreciate the significance of these reasons to exercise. 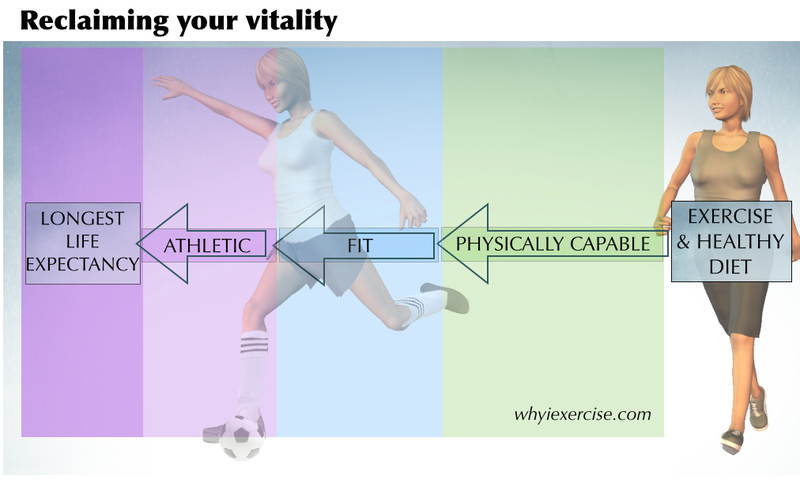 If you feel the need to become more active, my free exercise program will connect you with the resources on whyiexercise.com that help you create a doable, yet effective, weekly exercise schedule. 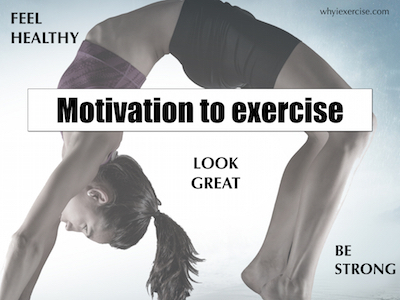 Motivation to exercise If you’re like most of us, you want to look great, feel healthy and be strong. Find out how you can overcome your busy schedule and put consistent effort toward the great looking, fit body that you want and need. Benefits of aerobic exercise The benefits of aerobic exercise come from positive changes in your heart, blood vessels, muscle cells, lungs and nervous system. 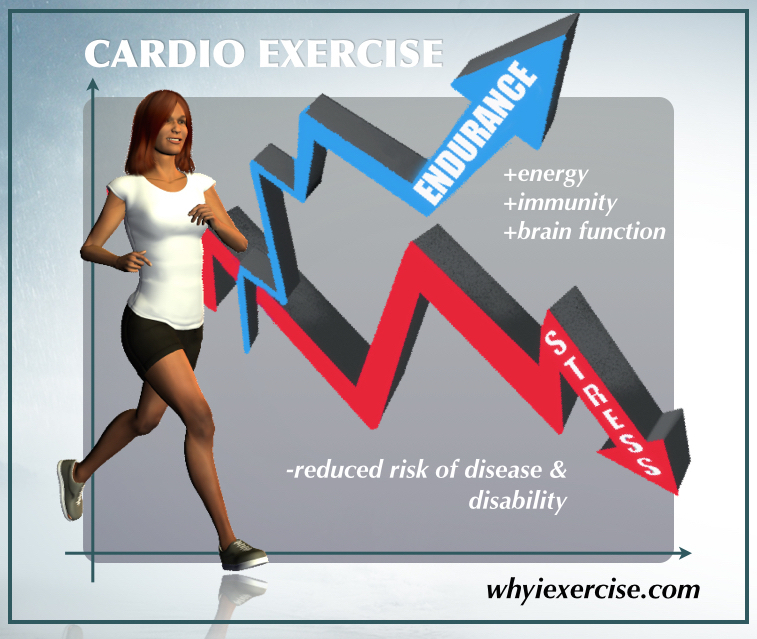 Cardio training makes you able to work at a higher intensity with less effort. Current research even shows a major impact on brain functioning! Are you able to get your work done without a sense of strain or fatigue? 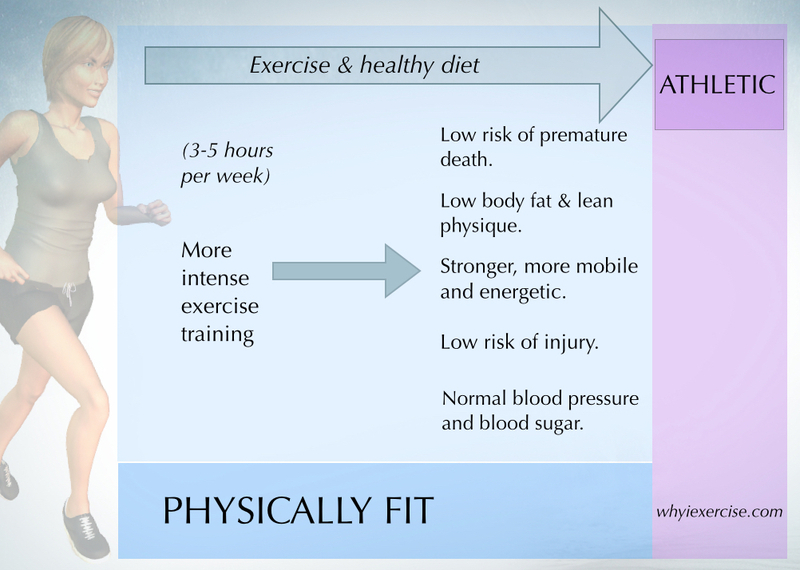 Physical fitness also has to do with how well your body works for you in everyday life. See how you measure up to this standard of well-being. Return to weight loss tips. Return from reasons to exercise to home page: Why I exercise.